With his new solo album 'Metal Cowboy', Ron Keel blends his rock and country inspirations together in a way that should make all the finest southern rock/metal acts feel slightly afraid of the competition. Hence, Alexandra Mrozowska talks with the "metal cowboy" about the details of the above record, his recently published autobiography and more. Can you take us through your personal highlights of your new solo album 'Metal Cowboy'? RK: It has been a long wild ride since I made the decision to create this project – then the brutal but wonderful creative phase, since this is the first album of my career which I've written all the songs for. The long nine month recording process with some amazing musicians, listening to my dream become a reality during that time...musical highlights are too numerous to mention. We tried to make every song, every vocal, every lick a highlight. If I didn't love every song, they wouldn't be on the album. In some respects 'Metal Cowboy' is your first solo album, since the previous one was mostly a retrospective journey through your career. Why did it take you so long to release a full solo album? RK: The past five years I've been devoted to the KEEL reunion, my Las Vegas show, doing 150+ gigs every year, writing the book...a project like 'Metal Cowboy' demands a lot of focus, a lot of long nights with the guitar and the whiskey bottle pouring your heart out. And I think I finally came full circle creatively, to a time and place in my life when I could really express myself like this. 'Metal Cowboy' is the best of both worlds of Ron Keel – metal blended together with country. Could you expand on this? What about the title? RK: 'Metal Cowboy' describes the music and the direction perfectly – the "metal" comes from the vocalist screaming his guts out, wild guitar solos, huge rock drum grooves pounded out in full force. The "cowboy" comes from the additional instrumentation like dobro & slide guitars. The bond between the "metal" and the "cowboy" is in the songs – a true combination of strong power riffs but with lyrics that really tell stories and paint pictures. I've been doing this long enough to know that you're never going to please everybody. My primary goal was to create a musical world where I could feel at home, an album that I know I'll enjoy listening to for the rest of my life and always be proud of it. The overwhelming positive response from the fans and the media is an added bonus, it means so much to me - it seems that there is a little Metal Cowboy or Metal Cowgirl in everyone. At times, your new record reminds me of the Lynyrd Skynyrd modern-day albums – and not only because of the obvious lyrical reference in 'What Would Skynyrd Do', but also because of the country-meets-metal style. What were your outward inspirations while working on the album? RK: For the past 18 years, during the Rickey Medlocke era, Skynyrd has released some really great albums that are much heavier than the classic stuff they are known for. I became a Skynyrd fan all over again with their 1998 album 'Edge Of Forever', and their latest – 'Last Of A Dyin' Breed' – is a very strong piece of work. I just spoke to Medlocke yesterday, he's my guest on the radio show next week, and he's largely responsible for the modern Skynyrd sound – plus Michael Cartellone (from Damn Yankees) has been playing drums for them for the past 15 years or so and he's brought a real hard rock edge to the band as well. But there were no new inspirations during the creation of 'Metal Cowboy' – in fact, during the entire process, I did not listen to any music at all other than what I played on my radio show. I didn't want any influences or inspirations, I wanted this music to come from my own heart. It was tough, because Skynyrd released 'Last Of A Dyin' Breed' when I was writing my new album, and as bad as I wanted to hear it I did not listen to it until my songs were written because I did not want to be influenced by outside sources. Please tell us a bit more about the impressive line-up of guest musicians playing on the record and their input on the album. RK: I think it's really cool that I was able to do a lot of the heavy lifting on the sessions myself, while also bringing some very special friends on board as well. I played all the rhythm guitars, some bass tracks, even some lead and slide guitar – and of course all of the lead vocals except for the incredible duet with Paul Shortino on 'Singers, Hookers & Thieves'. The tracks were all built on the rock solid foundation of drums played by Mike Vanderhule (Y&T). Frank Hannon was my first choice for lead guitar and slide guitar, and not only did he go all-in on this project, we've just done our first round of shows together in Sacramento & San Francisco last week and there is some real magic there. KEEL bassist Geno Arce, Travis Toy from Rascal Flatts was our MVP, his dobro tracks give the whole album that Wild West sound. Brent Muscat from Faster Pussycat, and Ronnie Mancuso from Jake E. Lee's band all delivered valuable contributions, but a couple of lesser known guys from my Vegas-based band really came through for me as well – lead guitarist Keith Robert laid down some awesome solos and Kenn Tonn played bass on 'What Would Skynyrd Do'. Some great backing vocals featuring various combinations of Kyle Kruger, Janea Ebs, Stacey Blades from LA Guns – Carol-Lyn Liddle and my wife Reneè did amazing on the Metal Cowgirl backing vocals on 'Skynyrd'. I wanted a real album feel to this this thing, not an all-star collection of songs. This music is very personal for me, but part of the fun of it is inviting your good friends to the party! Songs such as 'Singers, Hookers & Thieves' or 'Just Like Tennessee' immediately give one a nostalgia trip to their own past and place of origin. Any comment upon them? RK: All these songs are autobiographical, pretty much the story of my life set to music – so it's really special when an artist's personal experiences also resonate with others. 'Tennessee' is just another heartbroke song about a drifter trying to outrun the memory of a love that didn't last; 'Singers, Hookers & Thieves', is also very autobiographical while comparing the life of a singer to those of hookers & thieves...we'll always tell you just what you want to believe, the only difference is some of us are selling it and others are stealing it. 'Evil Wicked Mean & Nasty' surely rings a bell with everyone familiar with Keel's 1989 'Larger Than Live' release. What was the reason for re-recording the song and how do you think it differs from Keel 1989 version? RK: After KEEL went on a 20-year vacation in '89, I kept including 'Evil Wicked' in my live shows with Fair Game and IronHorse, and that song just always worked even for audiences that had never heard it before, and people kept telling me I should re-record it. On many of my albums we've put a cover song on there, so I thought for 'Metal Cowboy' I should cover one of my favorite KEEL songs! For the new version, we smoothed out the groove a little bit and added harmonica to kind of 'southernize' it. I think it's cool how well this song fits on the new album, providing kind of a bridge between classic KEEL and the new era. Although 'Metal Cowboy' is a studio album, there's a certain "live" feeling to it, especially in '3 Chord Drinkin' Song'. What was the idea for such an effect? RK: '3 Chord Drinkin' Song' was recorded live, first take, no overdubs, with just three microphones – old school baby! That was a special occasion – I'd always wanted to write a song with that title, and once I had most of the lyrics finished I put it away – I never practiced it, never sang it, just had it in my head – I wanted the first time I ever played it and sang it to be on the recording. I invited my friends the Sin City Sinners, local Vegas legends, to come in and do the track with me – I didn't play it for them, we didn't rehearse it, I just kind of talked them through it, and we just made a lot of it up as we went along – five minutes later we had the take, a priceless moment in RK history! Many reviewers also mention no sound processing or computer effects being used throughout the recording process. Have you really had such a traditional approach towards recording the album? RK: That's not exactly correct. The entire album was recorded in a state-of-the art studio in Vegas called The Hideout, using Pro-Tools software, and there is of course processing like compression, EQ, reverb, delay and all that. The traditional approach came from a desire to keep the sound organic with the right amount of polish, and not squeeze the life out if it with the technology. One thing I'm very proud of is there was absolutely no 'auto-tuning' of the vocals – every note is exactly like I sang it. You co-produced 'Metal Cowboy' with R. Bernard Mann, responsible also for sound mixing and mastering. Weren't you tempted to shun the outward influences and produce the album on your own? RK: Even though 'Metal Cowboy' is a solo album, making music is a team sport, at least it is for me. Part of being in charge is knowing how to assemble a great team and letting everyone else contribute their skills. I called the last shot on this one, but when I'm singing and playing I want to devote myself to those tasks and let someone with great ears and tech skills to make sure it's recorded properly. And I love it when my producer or the players come up with great ideas and suggestions that I might not have thought of. Since the days when I worked with Gene Simmons, I've always enjoyed being produced and having someone who will push me to do my very best. The album was put out through your own company – Wild West Media Productions. Why not doing it through the big label? RK: It's the difference between owning your house or renting it. 'Metal Cowboy' is my property, and I'm tired of having other people tell me what I can and can't do with my music. I just wanted to retain ownership of this project. This is my music, this is my business, and it feels good to own it and not have to look over my shoulder and answer to anyone else. 'Metal Cowboy' was released simultaneously with 'Even Keel: Life On The Streets of Rock & Roll', your eagerly awaited autobiography. What was the process of writing the book for you – a trip down memory lane, an emotional catharsis, reckoning with past wrongs and rights...? RK: I am a man who is always looking forward – to the next challenge, the next show, the next song. So to put on the brakes and look in the rear view mirror was a different kind of challenge for me, but I enjoyed reliving the experiences that made me who I am and telling my life story in a way that I think is entertaining and interesting to the reader. It's a little strange now that everyone who's read the book knows all my deep dark secrets – I was just writing it down, telling my story and trying to keep it real. In 2013, a former Steeler member Rik Fox joined you and Keel members for a gig at the Whiskey A Go Go. Please tell us more about this – and the experience of sharing the stage with Rik again and playing Steeler classics after thirty years? RK: Everyone who experienced that magical time in the heyday of 80's metal is part of a select brotherhood. Rik and I were bandmates during that time in history, and it was very special to have him join us onstage for a couple of Steeler songs. One of the most impressive things about the new album are your vocals. How do you manage to keep your voice in shape after all those years of recording and playing live? RK: Thank you for that. It's of course a combination of factors – training, experience, technique – but most important it's gotta come from the heart. I always want to push the limits, belt it out, and sing every song like it's gonna be my last. There are a lot of singers from my generation – not naming names – that are just going through the motions and mailing it in. Not this guy – I pour every ounce of energy and passion into everything song I sing, everything I do. Also, my vocal technique is designed to maintain my tone and endurance – not blowing air through my pipes, but singing in what I call a 'connected' tone and using the entire body, not just the throat, to create the sound. And not just on stage, but in your everyday speaking voice, when you're spending hours on the phone, or talking to people, doing interviews – if you don't connect your tone correctly, that will blow your voice out. Other than that, it's important to have at least a couple hours' sleep each night, warm up properly, and the right combination of whiskey and cigarettes. You're also an established radio personality. After years of being interviewed and appearing in various programmes, how does it feel to see the other side of things? RK: It's way more challenging to be the one conducting the interview – it's much easier to just respond to the questions. As an interviewer, you have to ask the right questions, know how and when to steer the interview in the direction you want. We try to keep the interview segments to six minutes or break them up into segments, because on my radio show we rarely go more than six minutes without playing music, and it's tough to hit all the bullet points in that amount of time – and I know, because I'm an artist, that these people are crazy busy and you need to keep the interviews brief. The usual length of a phone conversation is about 12 minutes total, say hello and chat for a minute, grab the interview, and a couple of show ID's. RK: It's pretty simple – once you unleash something like this, you gotta work it. Do every interview you can, play every show you can, spread the word every day by every means possible. I'm performing on the Monsters Of Rock Cruise, solo shows from coast to coast, meet and greets, personal appearances, interviews like this one, just working it. KEEL will be celebrating our 30th anniversary with a big show at the M3 Festival in Baltimore on April 26th. I just want to fill the squares on the calendar with shows! In the end, is there anything you'd like to add for Fireworks readers? RK: Thank you for the chance to talk about my work – and thanks to everyone who shells out their hard-earned cash for my music, my book, my shows. 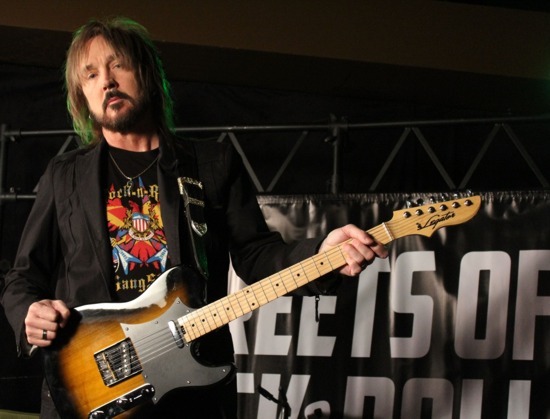 I really appreciate every one of you, and hope that you keep on rocking with me at http://ronkeel.com!